In panel 1 of 3, a man speaks into a microphone, behind a lectern, on a raised platform. An audience is in attendance. Man at microphone: Keep your credit card info secret to prevent unauthorized charges. Voice from audience: But that's security by obscurity! That doesn't work! Panel 2 of 3 shows an audience and a man standing with head bowed. Off-panel voice: Sir, this is the Credit Card Convention. 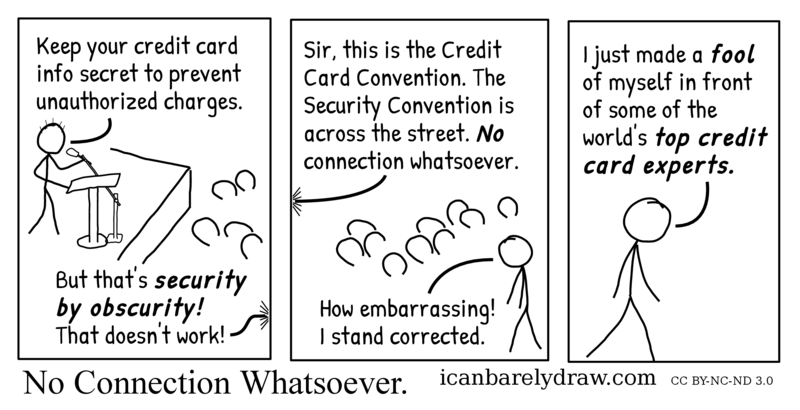 The Security Convention is across the street. No connection whatsoever. Man with head bowed: How embarrassing! I stand corrected. The third and final panel shows the same man walking away, head still bowed. Man with head bowed: I just made a fool of myself in front of some of the world's top credit card experts.